One of the most important aspects of trying to organize your life is making sure that you have the space and time to actually live in the first place. Usually, a hectic lifestyle that is built around fighting fires and dealing with things one-by-one comes from having to de-clutter your lifestyle and remove some of the tedious tasks that many of us can get involved in from time to time. If you want to start making plans to reduce your clutter, then these 5 ways to de-clutter your life should help massively. When you start to cut through the nonsense that fills up your home you can make a genuine difference to your chances of long-term success. Your home is where you relax and take your mind off of clutter and mess, not bring it straight back on! We all find ourselves wasting a little time every now and then, on the basis that we have too much going on in our lives. 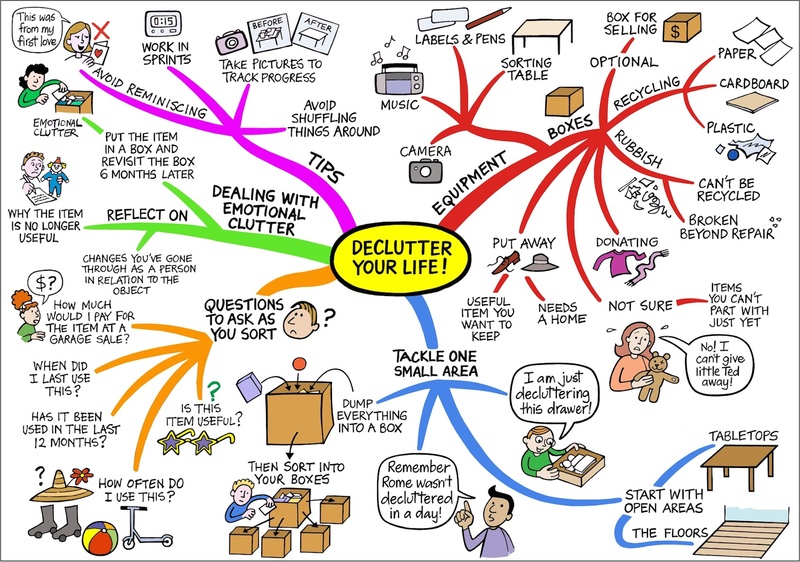 If this sums you up to a T, then you need to start considering the various ways that you can de-clutter your life quickly and easily. Find out what activities you carry out on a regular basis, that aren’t really productive – or enjoyable – and stop it from being a regular habit. The amount of time and money that you can save just by cutting back on silly habits can be quite incredible. One of the easiest ways to waste your time and your patience is to hang around with people who aren’t positive individuals. It’s very easy to get yourself in a negative spiral and to think about all the bad things that might happen in the future – purely on the basis that the company you hang around with will influence your mood. Do you find that most of your friends are negative people who look at the “Don’t”s in this world, rather than the “Do”s? If so, you need to change who you spend your time with. Being happy and feeling productive is a by-product of getting involved with the right kinds of individuals and hanging around with people who are likeminded. De-clutter by spending time with people who promote love, not guilt and shame. If you can find that your “To-Do” list has at least ten things on it every day, this can be a problem as finding the time to do each of them efficiently and in the right manner can be a bit of a process on its own, never mind actually making a difference in the long-term. So, instead of fighting fires and trying to get all of your tasks done as fast as you can why not consider the importance of de-cluttering your to-do list and making sure that you are working on a smaller set of tasks that you can truly concentrate on. A lack of definition will kill anyone’s chances of being productive so if you want to make sure that you hit the right notes and that you are being productive, you should make sure that you set clearly defined goals which you can look back on with fondness in the future. Don’t let a lack of clarity hold you back forever.